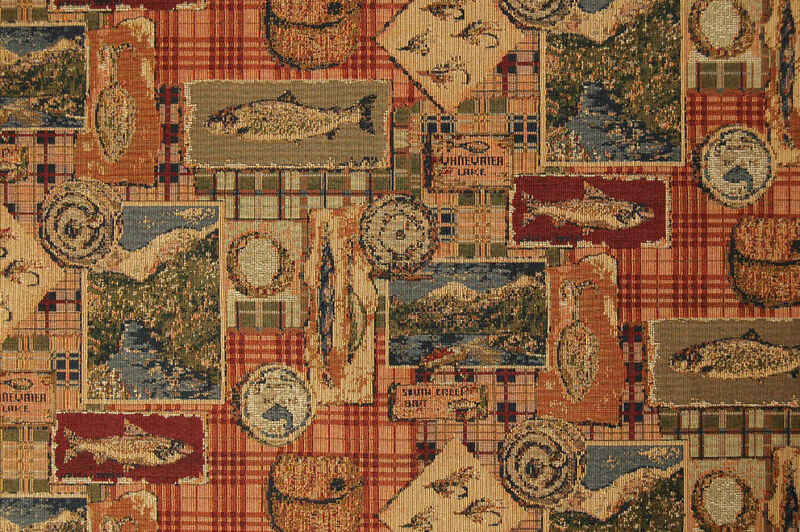 Fishing themed fabrics are being used for creating rustic looks in a cabin, lodge or any area where the theme is appropriate, such as your favorite fisherman’s man cave! Our parent company, Grace Mfg. Inc., fell in love so much with this look that a bass wrought iron stool was created for it which has been a big hit with the fishing crowd. The fabrics that we offer are durable with easy cleaning instructions and have been tested for long lasting wear and tear. Save this page as we update when we can find new fabrics with this theme that meet our high standards and are suitable for upholstering and decorative needs. 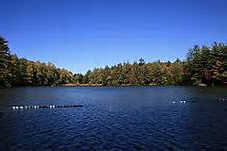 When I was seven years old, my father became the manager of a lake outside of Conyers, Georgia, which was a vacation development for many people from Atlanta and home to some of us. These were more idyllic times, when a child could go out alone and not fear being killed or kidnapped and I spent hours alone next to that lake or in the woods tramping through old civil war ruins and gravesites, building shelters over ravines for prehistoric caves and learning to be as still as a Cherokee slipping through hidden passages to watch the wildlife around me. 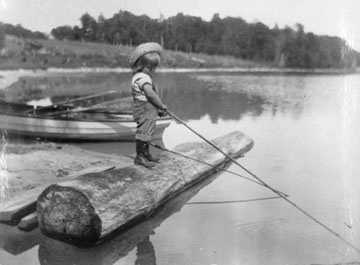 And among those happy memories, and perhaps my favorite, are the times my father taught me how to fish. 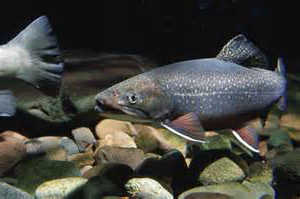 Not normally a patient man, he changed with a fly rod in his hand, coaxing the fish in to end up fried up in a pan that night for supper. Being too small to utilize a fly rod properly, my sister and I were taught how to use a rod and reel and both of us managed to stay still and catch our fair share of dinner. He taught me to watch for the best places to throw in my line, how to put a wriggly red worm on my hook and how to watch the water. He had a tool box full of fishing lures that he guarded carefully from little hands but always picked the best ones when we were allowed to use them for our poles, talking to us while he put them on our poles, demonstrating a gentler side to us that was rarely seen away from the water’s edge. “Wait for a good tug, not just a nibble,” he would admonish me quietly as I would get excited when I felt that slight movement through the rod. 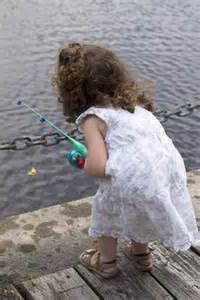 My sister was better than I was and was a marvel at three years of age with her ability to be still and actually bring the fish in! Our father was so proud of both of us and would come and help us get our catch off our lines and occasionally fish out the fishing rod that had gotten away with our fish from the deeper parts of the lake. It was something that I will always share with my father, even though he has been gone for many years, killed in a car crash when I was in my twenties. I always think about him and the times we fished together from that lake to the summer vacations in Florida when we would rent a boat and fish for bigger rewards. When I pick up a fishing pole today, I still hear his whispered voice reminding me that the fish could hear me, so be quiet around the water’s edge. 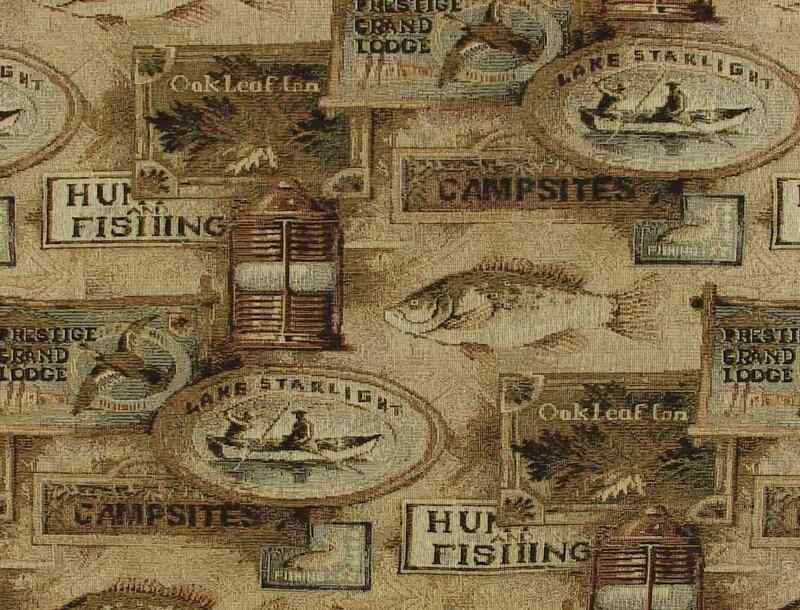 He and my mother had a camper during their later years that was always parked near someplace to fish with either a rod and reel or his faithful fly rod in use for hours while mother would prepare the fish for that night’s supper. It was something we all enjoyed, except perhaps for my mother, who told me, “And never let your husband know that you know how to clean a fish- you will have to do it for the rest of your life!” And so I never did.